[Above: Accommodations at the Villages Nature ecoresort, a collaboration by Euro Disney and its French partner, Pierre et Vacances, owner of Center Parcs Europe. 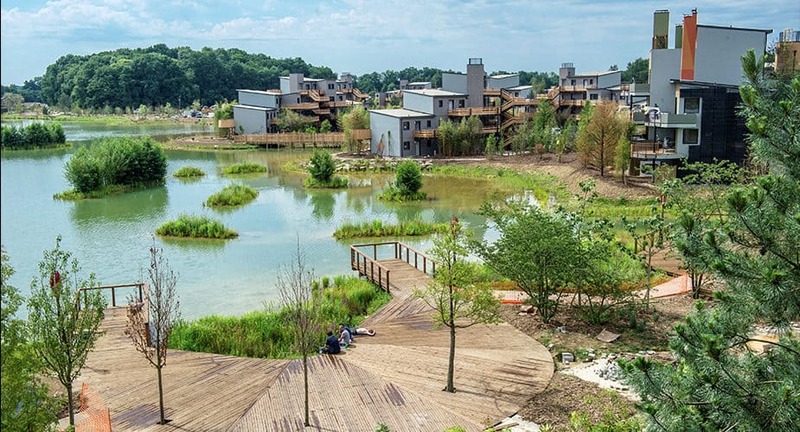 Over the course of four visits to the new Villages Nature resort outside of Paris, I have become convinced that the world now has a new model for sustainable resorts and their neighboring communities. On each visit, I developed a deeper appreciation for the design, the sustainability features, and the inspirational model Villages Nature represents. My first visit, May of 2017, was during construction. Frank Heatherton, the Master Planner for the resort, gave me a tour. He shared a design that I believe is a potential game changer for sustainable tourism as it provides a high quality resort and tourism experience while mitigating the issues defined by the science of the Nine Planetary Boundaries put forth by the Stockholm Resilience Center. Villages Nature launched on October 10, 2017. During my second visit, at the inauguration, I had the opportunity to speak with Joe Rohde, the Walt Disney Imagineer who contributed to much of the design of Villages Nature. Part of the 300-acre Villages Nature resort. “What were the key goals of Villages Nature?” I asked. From these conversations, I learned that despite Villages Nature paying no specific attention to the science or framework of the Nine Planetary Boundaries, the resort was operating with real promise to significantly address all nine of them. 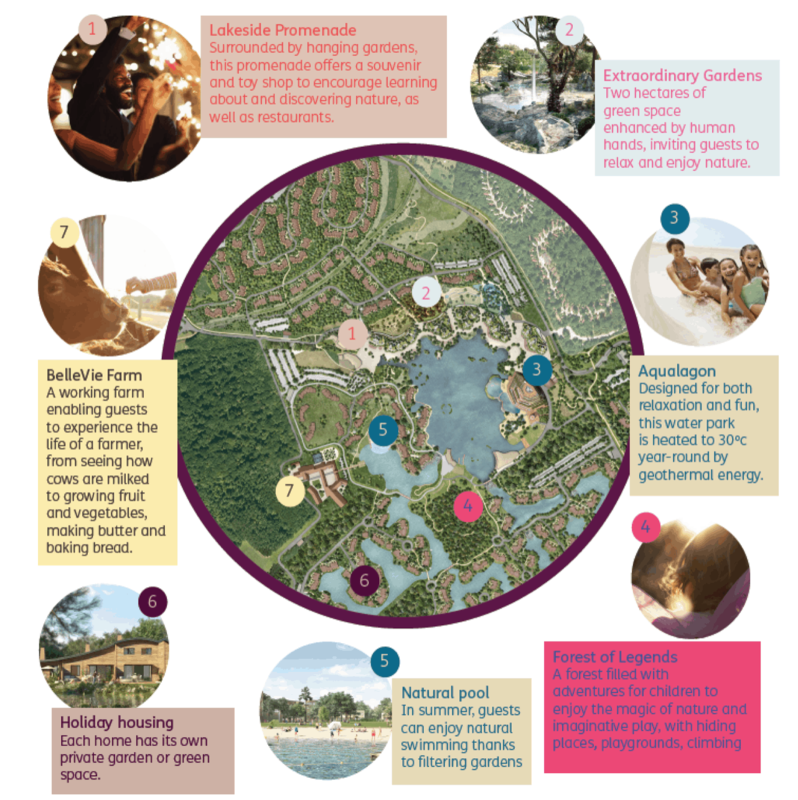 Here a new model for sustainable tourism for the world has been born, using Bioregional’s One Planet Living framework along with the expertise of the Walt Disney Imagineers and other team members like Thierry Haua. The Aqualagon—a 9000 square meter water park. The Promenade—an array of restaurants featuring local and organic food and shops featuring nature discovery items along with items to improve health and well being. The Forest Legends—a playground with games designed to help families reconnect to nature. The Belle Vie Farm—literally a farm-to-table opportunity coupled with ways for people to learn about growing their own food and cooking it. The Extraordinary Gardens—four gardens themed to Earth, Fire, Air, and Water that provide games to learn the One Planet Living process and a meditative garden walk to connect with nature. Map of Villages Nature shows the five themed areas, housing, and the pool..
My third visit I learned that the resort received the World Hospitality Award for “Best Initiative in Sustainable Development and Social Responsibility.” I also invited Villages Nature to participate in a pilot program for the new Blue Community Certification that includes the GSTC criteria, the 12 blue community strategies to protect, enhance, and restore coastal habitat and marine environments, and the One Planet Living framework. My fourth visit was for Villages Nature’s one-year anniversary conference, on Leadership and Governance for Sustainable Tourism, co-hosted by Blue Community. We were able to present the Blue Community Certification to the resort. The certification has four levels, and Villages Nature achieved the highest. The 18-kilometer geothermal system that heats not only all of Villages Nature but also 30% of the two Euro Disney theme parks. The system reduces CO2 by 9,000 tons a year. A construction process that reused all excavated soil and diverted 98% of construction waste away from landfill. A composting system that includes participation of waste separation in every cottage—zero waste to landfill. A biodiversity plan that protects 72 species and brought back an additional 23. The planting of 28,000 trees and 430,000 plants. Water conservation efforts that keep the resort from ever tapping the aquifer. We at Blue Community are now implementing projects in Florida where existing resorts are becoming more sustainable by integrating the Villages Nature model of the One Planet Living framework, the Blue Community strategies, and PM4SD (Project Management For Sustainable Development) skills. Let us know if you want to bring this to your resort or community.